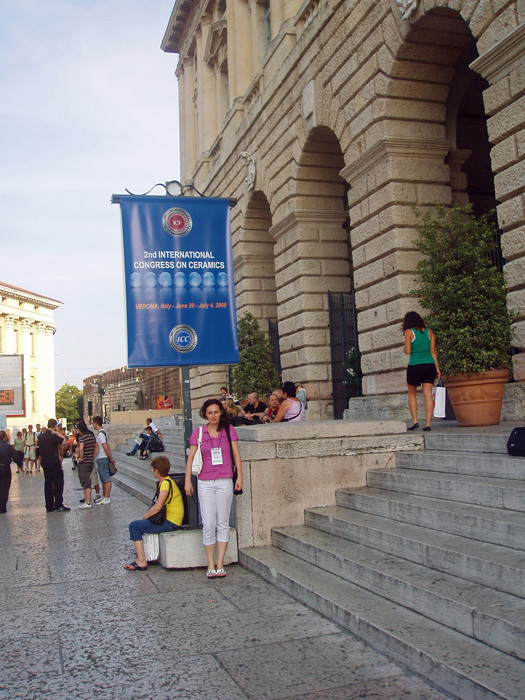 Between June 29 and July 4, 2008, Dr. Tamara Ivetić, research assistant of the Institute of Technical Sciences of the Serbian Academy of Sciences and Arts, participated in Second International Congress on Ceramics (ICC2) held in Verona, Italy. Her participation was financialy suported by the Ministary of Science and Technological Developmentof the Republic of Serbia. The International Ceramics Federation (ICF) endorses and promotes the organization of the International Congress on Ceramics (ICC). Every two years ICF appoints a National Ceramic Society that will organize the next ICC as representative of a different macro-region of the world. 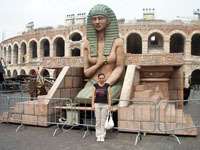 Dr. Tamara Ivetić in front of the Roman "ARENA"
to devise a global sustainable development strategy through deep analysis and comparison of opinions. 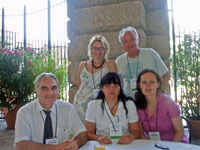 The ICF entrusted the organisation of the ICC2 to the European Ceramic Society (ECerS – the Federation of the European National Societies), and he Italian Ceramic Society, which then identified the sutable organisational structure – ISTEC – Institute of Sciences and Technology for Ceramics – Faenza and CNR – Italian National Research Council for the scientific aspects, and the Agenzia Polo Ceramico (Not-for-profit Consortium) – Faenza for the tecnical aspects. 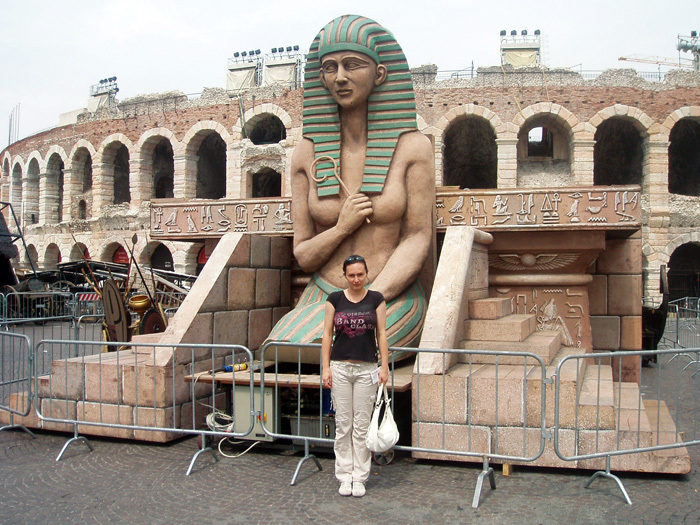 The ICC2 Venue was the admirale Gran Guardia Palace, a 1610 Sanmicheli inspired building, that sits in front of the famous Roman ruins of Verona’s own coliseum “the Amphitheatre ARENA”. ICC2 boasted more than 40 participating countries and more than 120 invited contributions, also hosting 10 guest delegations from leading ICF member societies whose participation was particulary appreciated in the Policy-making Sessions, where research and development policies and industrial production strategies were presented and compared. The Policy Sessions were dedicated to Europe and the countries to which ICC2 aimed especially to offer grounds for comparison: Russia, China, India, Turkey, Iran and finally the USA in relation to the ICC1 Roadmap and Japan in relation to the upcoming ICC3 Roadmap. ICC2 also focused on the state of the art (Science and Technology Sessions) within six thematic areas, including development perspectives of industrial and academic sectors. Three cross-cutting issues were also addressed within the Grand Challenges dedicated to Energy, Environment, and Health. Special events dedicated to Electronic Ceramics, Geopolymers and Career Options were accompanied with targeted International Workshops. Of particular institutional importance for the ICF and for the ECerS were the contributions made during participations in a) ICF Technical Committee meetings: “Education” and “Health Aspects of Ceramic Nanoparticles”, and b) the ECerS “Art Design and Traditions” Working Group with the accompanying art show “Voices from the Deep” by maestro Enzo Babini, who has worked the clays of the five continents. Special event “Career Options" offered an opportunity to students (more than 100 participants, 50% of whom were sponsored by the ceramics society) to discuss their professional future nad career opportunities. 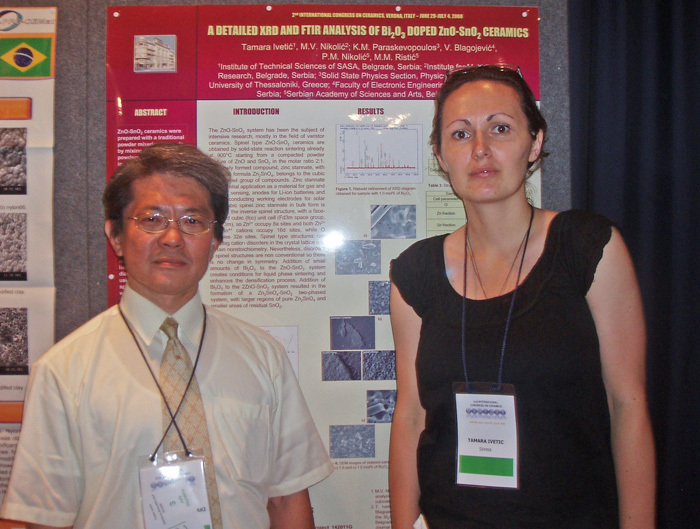 Dr. Tamara Ivetić sucesfully presented a scientific paper entitled: “A detailed XRD and FTIR analysis of Bi2O3 doped ZnO-SnO2 ceramics” authored by: T. Ivetić, M.V. Nikolić, K.M. Paraskevopoulos, V. Blagojević, P.M. Nikolić, M.M. 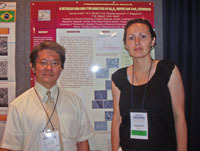 Ristić, presented as a poster (6-P-123) within the Ceramic Science and Technology Session (Theme 6 – New Production Technologies – Nanofabrication). 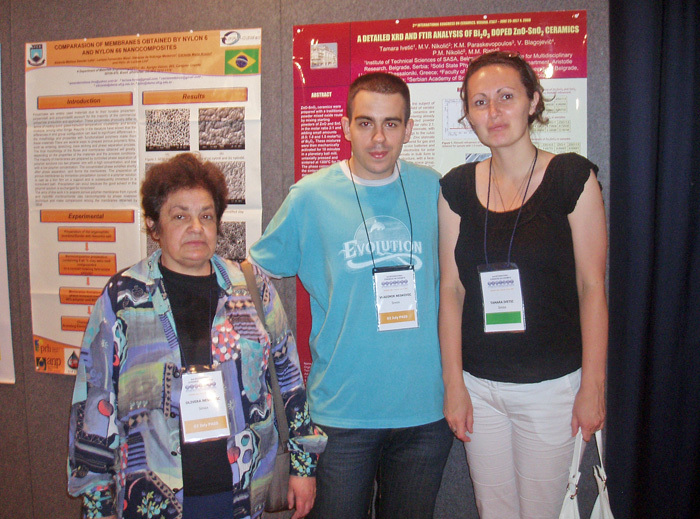 During the ICC2 Dr. Tamara Ivetić had the opportunity to make contacts with colleagues from around the world. The marvellous city of Verona with its outstanding sights: the Roman ruins of the ARENA coliseum, wonderful squares like Piazza Erbe and Piazza San Zeno, many buildings dating back to the Scaligeri period (13th and 14th centuries) period, the Lamberti Tower, an exquisite example of the Romanesque period, Juliet’s house in Via Cappello 23, where supposed “Shakespeare’s storia d’amore” of Romeo and Juliet took place, etc. made an unforgettable impression. Within the Conference social programme, the participants had the opportunity to enjoy an open-air performance of Giuseppe Verdi’s opera Nabucco in the Roman ARENA.